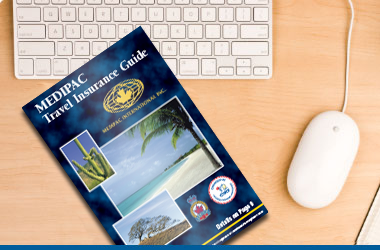 The Medipac Travel Insurance Guide is actually a 48 page travel insurance guide that provides industry and other tips on how to save money on your travel insurance cost. The Guide will also help you determine what is important and the key features to look for in a travel insurance package. Order your Medipac Travel Insurance Guide today! Title:- Title Mr. Mrs. Ms. Miss. Dr. Prof. Enter email to receive brochure immediately.